Are you serious about your health and fitness? Of course you are – if you weren’t you wouldn’t be here. The home gym is all about convenience, so choosing the right equipment for your needs is a pretty big deal. So what sort of things should you consider? Don’t worry – here’s a complete breakdown of the things you might want to think about before converting your garage into the home gym of your dreams. Why do you work out? What are you trying to achieve? If you can’t answer these questions, you are more likely to find yourself with a collection of machines and gym equipment that gather dust instead of being used regularly. Take a second to really examine your goals – if you are trying to build muscle and size, you are probably more likely to opt for pinned weight machines that let you perform isolate movements, whereas people wanting to lose weight might go for cardio machines and light hand weights. You might even want to build power and speed for athletic performance, which means you may consider more functional fitness equipment. It doesn’t matter what you need to reach your goals, you can find it at a specialty store like Fitness Market. Goals are one thing, but you only achieve them if you stay motivated to keep at it day after day. If you want to build muscle but hate sitting there pumping out rep after rep, you are going to find it more difficult to turn up (even if it is literally down the hall from the TV!) If you want to lose weight but can’t think of anything more excruciating than spending time on a treadmill, then guess what: that treadmill is going to end up making a really nice home for a family of spiders. There is more than one path to your dream body. Try to think outside the box and create a home gym that makes you excited to be there. Find alternatives to the traditional – skip the jog on the treadmill and opt for a high-intensity bodyweight session, or forget the weight machines and get into some compound weightlifting moves. Ok, now that you know what your dream home gym looks like, it’s time for the reality check. What does your space really allow for? If you have a single car garage, you might get in a cardio machine and a couple of pinned machines, or you might want to leave the majority clear for free weight work. Also remember to factor in other uses if you can’t have exclusive use of the space. Do you need to leave a path to the washing machine, or have a spot for a motorbike? Good planning is the key to any effective home gym, so map it all out before you whip out your credit card. The amount of planning that goes into your home gym is often the difference between an awesome place that gets used regularly and a room full of wasted cash. 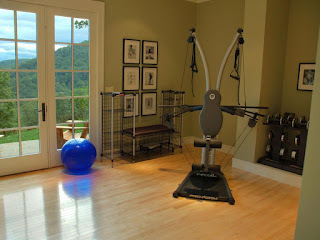 Do you have a home gym? How did you decide what you needed, and are you happy with it?